Bryce Canyon National Park is spectacular. We spent five whole days there, which for us is very unusual as we typically move around quite a bit during our adventures, never staying in one place for long. But this National Park is worth taking a few extra days to explore it and its surroundings. Our trip to Bryce Canyon was part of a larger trip to both Zion National Park and the North Rim of the Grand Canyon. So we managed to hit two of Utah’s “Mighty Five." One day we hope to visit the other three and manage a stop at Four Corners too. We approached Bryce Canyon National Park from the west and were first welcomed by the entrance to the Dixie National Forest (see photo above). As you enter this area you are immediately surrounded by tall, orange sand covered mountains and rock formations that you feel the urge to climb. So we did. Unfortunately, my son and I are afraid of heights, so we both climbed up these steep embankments that were covered in loose gravel and then froze with fear. We had to scoot back down, nearly on our bottoms, while my son shed a few tears. It was probably not our finest parenting moment. But this was a great introduction of what we were to come to expect in the National Park itself. The rock formations in Bryce Canyon are amazing and endless. The tall spires of rock are referred to as “Hoodoos” and there are valleys and valleys filled with them. Rather than try to describe them, I’m going to share our many photos. The park is essentially a narrow strip of land running north to south that is surrounded by the Dixie National Forest on both sides. There is a single main road the traverses the entire park that is only approximately 18 miles long. Along this road are numerous overlooks to stop at and get out to see the view. Expert tip: All of the overlooks are on the east side of the road, so if you plan to see the entire park, it is best to drive all the way to the end of the road, and then stop at all the overlooks on the way back. 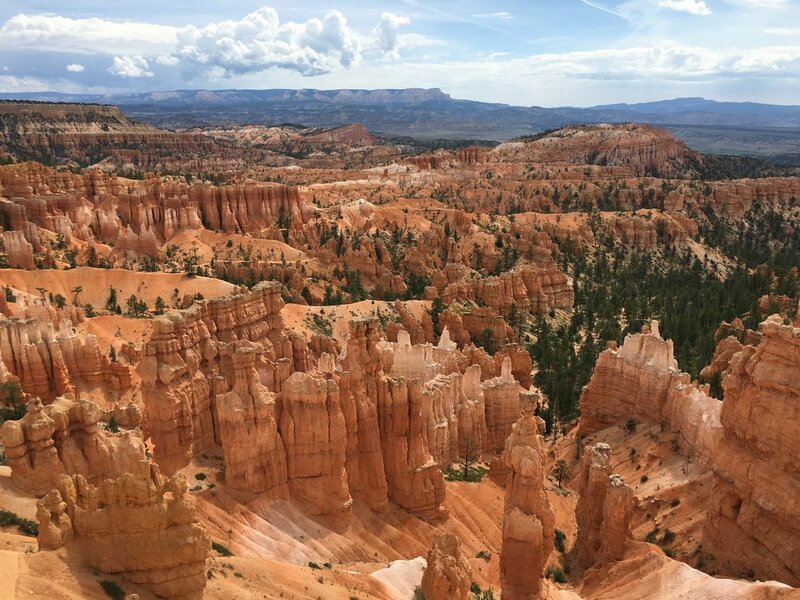 If you'd rather, there is also a shuttle bus that starts outside the park in Bryce Canyon City and stops at many of the main features in the north end of the park. We camped in our travel trailer at Ruby’s Inn RV Park and Campground. It’s famous in these parts and they just celebrated their 100-year anniversary. We stayed at site #150 which was a great pull-through site. This place is fabulous. They have full hookup sites, a pool and hot tub, tent areas, teepees, and cabins. There is also a flat area in the back of the campground that is reserved for large toy haulers. Plus, the shuttle stop into the National Park is located right at the entrance to the campground. We quickly figured out that the family who runs the campground essentially owns all the property right outside the National Park land, as nearly everything begins with “Ruby’s…” We took advantage of their abundance of local activities and took an ATV tour. Plus, we dined one night at Ebenezer’s Bar & Grill which is a cowboy revue show, and a must if you stay in these parts. There are also horseback riding tours, a nightly rodeo, and mountain bike rentals. A quaint strip of shops including an ice cream parlor and rock shop can be found in the Old Bryce Town Shops too. Every night we made a campfire and this is where we invented our famous “Smookie." Given we visited over the 4th of July we got to enjoy a great fireworks display from our campsite. The weather in July is cooler here than at the other nearby National Parks, such as Zion, and we got to enjoy a thunderstorm nearly every afternoon. To give you an idea of how much I fell in love with this National Park and Ruby’s Inn, I decided I want to spend my summers here when I retire and run the campground. So, when I'm done traveling, you'll know where to find me. Time to visit: A good portion of the road into the depths of the park can close during the winter due to snow. For guaranteed complete access to the park, I recommend you not visit during the winter, although the views are gorgeous when snow capped too. How to see it all: The overlooks are located on the east side of the 18 mile drive through the park. So, drive the entire length of the road, and then stop at the overlooks on the way back out of the park.